GTmetrix tested a total of 54 popular online retailers (32 American and 22 UK) – on desktop and mobile devices, every hour – over the Black Friday/Cyber Monday weekend. This blog post will focus on specific blips and blunders we noticed. A followup post will include more complete details on all of the online retailers we tested. Reasoning: The more granular the data is, the more trends we can hope to see. Hourly performance tests can help us see how each site performs as the hours go by. Note: Acer.com (US), Sainsbury’s (UK) and Dell (UK) encountered errors at the start of our monitoring run, and thus were excluded from this experiment. In an upcoming post, we will detail a complete report of all the online retailers we monitored, including page timings, scores and rankings of all 52 websites tested. For now, here are some highlights of how certain retailers fared during this year’s Black Friday/Cyber Monday event. 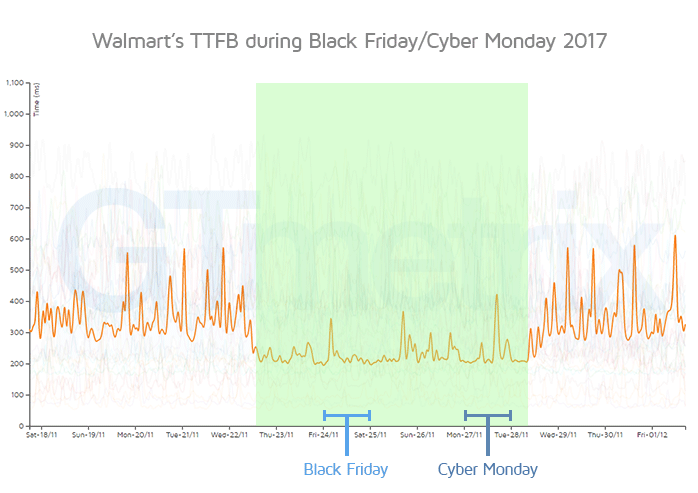 Walmart’s Time to First Byte (TTFB) dropped ~500ms to 150ms a few days prior to Black Friday, and remained low from the 22nd straight through to Cyber Monday. After the 28th, TTFB went back up to it’s previous performance. Walmart’s TTFB time was reduced for the Black Friday/Cyber Monday rush. From Walmart’s Waterfall Chart, TTFB was solely due to waiting time (time for the server to send data back). Walmart likely increased capacity before the Black Friday/Cyber Monday rush to ensure visitors’ connections were faster. This is an example of an excellent preventative measure. If you’re sure that you will experience an influx of traffic, being proactive about your performance makes a huge difference. 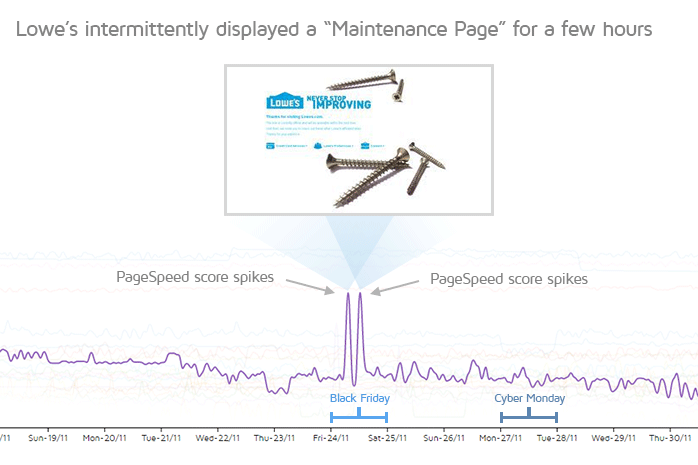 Lowe’s PageSpeed score spiked from an F to an A for some reason during Black Friday (and again during Cyber Monday) – investigating closer reveals that visitors were seeing a “Temporarily Down/Maintenance Page” sporadically from 7AM to 1PM. What some visitors saw when visiting Lowes.com during Black Friday. Some H&M visitors were told they may experience a “fashionable waiting time” during Black Friday. Lowe’s and H&M’s servers responded with a 503 error – either too busy or being down at the moment of testing. At times, GTmetrix was unable to successfully generate any tests at all – as the servers stopped responding entirely. This is likely due to inadequate hosting and resources. With too many visitors requesting assets and network resources, their servers could not stand up to the stress. Major trenches in PageSpeed score on Black Friday correlated with huge jumps in total page size for Steam. 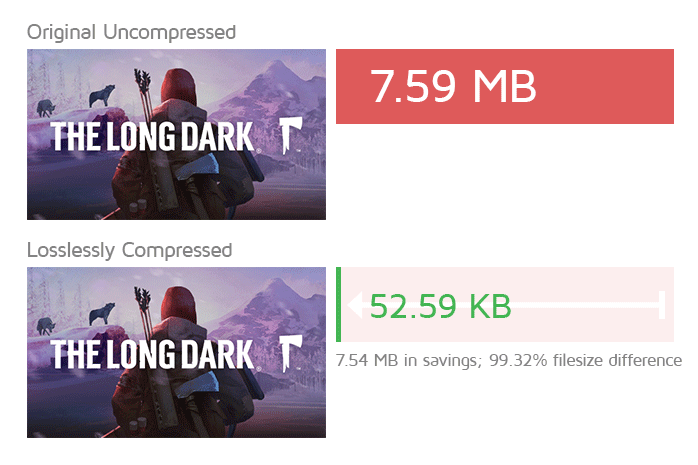 Steam periodically served an image that could have been compressed up to 99.32% – saving the visitor 7.4mb in data download! 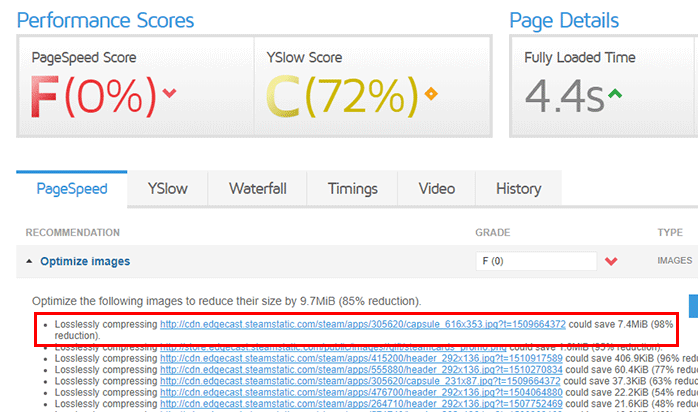 Upon investigation, we discovered it was due to a single unoptimized image that was a whopping 7.59mb! This single image caused a significant increase in Steam’s Total Page Size, decreasing their PageSpeed score massively. With so many updates and promotions being constantly cycled during Black Friday/Cyber Monday, it’s inevitable that some unoptimized content slips through the cracks. This is a good example of why it’s important to monitor your site for performance; It helps to ensure that all the work you put into optimizing your site doesn’t go to waste due to preventable mistakes. 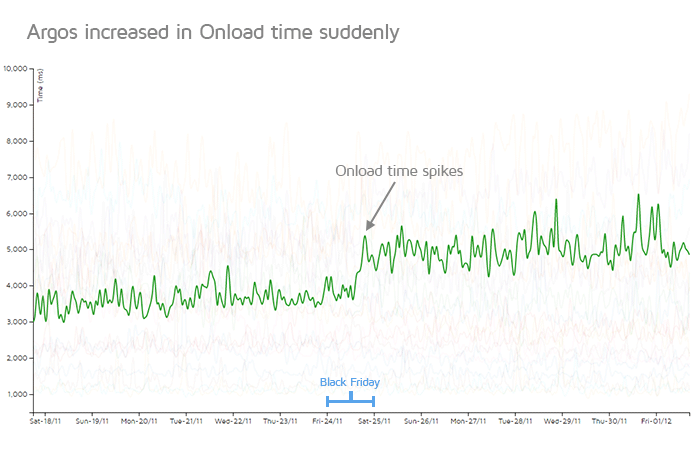 Though Onload/Fully loaded time wasn’t affected too much, Steam forced visitors to download more data than needed, and could have potentially reduced their bandwidth and data transfer by significant amounts (saving them mone!). This image’s filesize could have been reduced by 99.32%! By instituting a standard image compression policy on all new content pushed live, they could have reduced the size of that image alone by 99.32%. A jump in onload time during Black Friday prompted us to look into what happened to Argo’s site and AO.com at that moment. A sudden spike in Argos’ Onload time. AO.com also had an odd spike in Onload time. 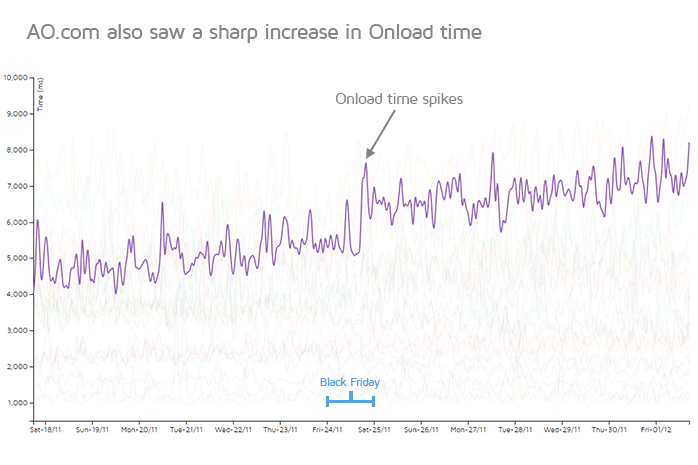 After investigating before and after Waterfall Charts for both sites, we see that the extended load time was caused by third-party requests which, for whatever reason, took much longer to execute than previous loads. 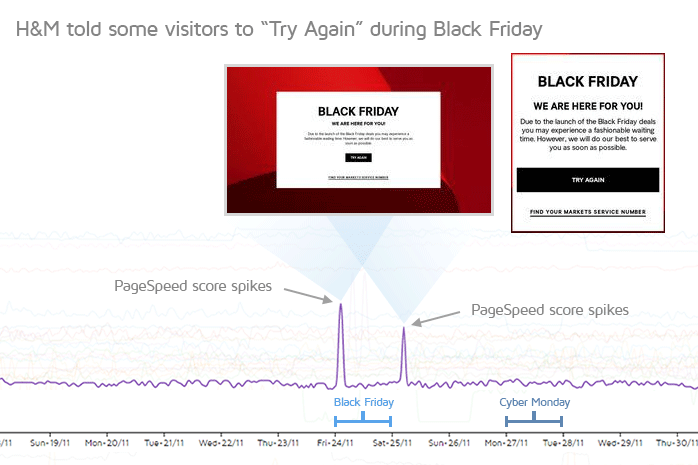 The impact on Argos’ and AO.com’s website is high, causing a 3+ second increase to Onload time during Black Friday and thereafter. This is yet another example of why it’s critical to monitor your site for performance – third-party resources are generally out of your control, and you should be the first to know if they’re affecting your website negatively before your visitors do. Unprepared servers are strained, and are prone to failure during massive traffic spikes. It’s one thing to have a slow website – it’s another (arguably worse scenario) to be completely offline and inaccessible to your visitors. As we’ve discussed before, a website’s load time is made up front-end and back-end performance. Sites that succumbed to 503 errors or were forced to display a “Try Again” page didn’t anticipate the sheer traffic hitting their servers and visitors ended up being turned away. We’ve all heard the infamous metric of visitors stating that they would abandon a site if it hasn’t loaded in 3 seconds – but you’re also not doing any good by telling them to try again later. Reduce strain on your servers by adding capacity, upgrading CPU/Memory/Bandwidth resources, or optimizing code/caching. Walmart is a shining example of how to anticipate and prepare for a surge in traffic. Knowing that Black Friday/Cyber Monday was around the corner, they increased their server capacity to ensure resources to handle the spike. 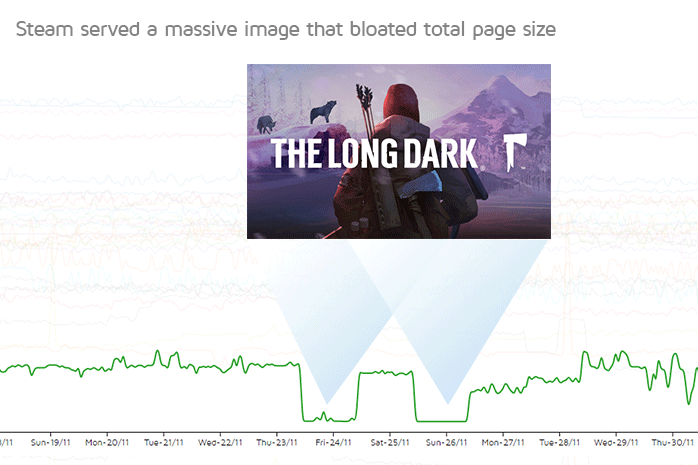 While Steam had a glaring problem with one of their images, the rest of the sites we tested scored an average of a D (69.6%) for the Optimize images recommendation. If you visited every online retailer listed above once, an average of 10.3MB of useless image data would be transferred unnecessarily, during Black Friday/Cyber Monday. Even if only 10 million people across the US and UK (very conservative) visited each site during the Black Friday/Cyber Monday weekend, this would equal 98.2 TB of useless data being transferred. Compressing images is one of the easiest, high impact optimizations you can do. It saves your visitors time in downloading unnecessary data, and saves you bandwidth and network costs. Make image optimization (compression at the very least) part of your pre-launch checklist for pushing content and updates live. There are many image compression services out there that do a great job of optimizing your photos without any perceivable drop in quality. Read more on Image Optimization here. Third-party resources can bring even the most optimized websites to a crawl. Third-party resources turned out to be one of the most impactful and unpredictable factors in our online retailers’ performance. The uncertainty of not being hosted on your server and therefore having no control over them makes tracking their performance even more important. What’s even more frightening is that many online retailers were using much more than one third-party resource – with some hovering around 52 third-party requests! If any of these third-party requests fail or underperform, your website will too. This is difficult to answer, because third-party resources are at times a necessary evil. The obvious solution is to reduce your usage of third-party widgets, opting for only the most beneficial for your business. Google Analytics, Crazy Egg, DoubleClick, etc. Mixpanel, Clicktale, Criteo, MailChimp, etc. Facebook, Pinterest, Twitter, Instagram widgets, YouTube embeds etc. It may be the case that you absolutely need all of the above third-party resources to achieve business objectives – removing them completely may not be an option. Instead, it’s important to monitor your site for performance to ensure that these third-party requests (among other possible issues) don’t unexpectedly cause a problem. If they do, you can be proactive about solving issues immediately, instead of facing ramifications from loss revenue or irritated customers. Get more monitoring slots and test your pages hourly along with more advanced options with a GTmetrix PRO plan.